NASCAR heads to Talladega Superspeedway this weekend for the GEICO 500. The 2.66-mile track is the largest one on the Monster Energy NASCAR Cup Series schedule. The edge-of-your-seat excitement produced by restrictor plate racing is paired with a great new fantasy game this weekend. 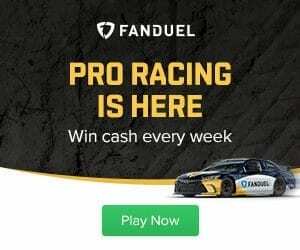 FanDuel announced earlier this week it will be opening up weekly NASCAR contests, the first of which debuts this Sunday at Talladega. Frontstretch.com is partnering with FanDuel for a $5 GEICO 500 NASCAR contest on opening weekend for your chance to win up to $300 in prize money and a $200 NASCAR Racing Experience Gift Card! FanDuel has put an emphasis on finishing position and completed laps. For this reason, it will be important to pinpoint drivers that have historically remained trouble free at one of the most chaotic tracks in NASCAR. Those who have played DraftKings fantasy NASCAR are very familiar with the term dominator. But with only 0.1 points awarded for each lap led by a driver, the need for a dominator is less important when building a winning lineup. The 188-lap race will only have a total of 18.8 points up for grabs in this category. That said, here are a few drivers to keep an eye on for the GEICO 500, courtesy Frontstretch.com's Corey Brewer. Keep in mind the FanDuel rules should have experienced fantasy players making a few key adjustments in order to produce winning teams. Keselowski has five Talladega wins, one fewer than Jeff Gordon and Dale Earnhardt Jr. He's become an elite restrictor-plate driver over the past few years and has wins at Talladega in three of the past four seasons, including in October 2017. He's also led 177 laps here the last four races so expect a few extra bonus points to come your way. With another win Sunday, Keselowski can cement himself as one of the greatest of all time to strap in at this speedway. Can he be the latest Ford driver to step up during their strong start to 2018? Busch’s lone Talladega win came in his first season with Joe Gibbs Racing. Though he has yet to head back to Victory Lane, the 2015 MENCS champion has finishes of second and third in the past two spring Talladega races. Busch is also the hottest driver on the circuit right now. He has won three races in a row and will look to stretch that to four on Sunday. With nothing to lose, Busch will be aggressive in trying to match the last four-win NASCAR streak on the circuit (Jimmie Johnson in 2007). In this race a season ago, Stenhouse captured his first Cup Series victory. He started on the pole and led 14 laps, also keeping his No. 17 near the front all day. Stenhouse then held off a hard-charging Kyle Busch in one of the most exciting finishes in recent memory. Stenhouse would later win a second race at Daytona, another superspeedway, in cementing his role as a rising star within Roush Fenway Racing. 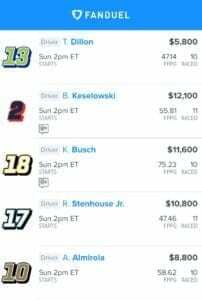 The veteran is priced among the elite drivers on FanDuel this weekend but that shouldn’t scare anyone away. He has five top-10 finishes in nine career starts at Talladega and Lady Luck typically bounces his way there. Dillon already has one restrictor plate win this season as his Daytona 500 victory in February sealed a spot in the NASCAR playoffs. During his young career, Dillon has become one of the rising stars at restrictor plate tracks. Though he did have a down 2017, wrecking out of both Talladega races, he was great in 2016. In the four restrictor plate races that year, Dillon finished inside the top 10 in all four, including a third-place result in this exact race. Add in that last-lap magic from Daytona and he's a good bet to be up front this coming weekend. Almirola was a half-lap from winning the Daytona 500 in this season's first race before being moved out of the way. Since then, he has been on a redemption mission. His average finish of 13.6 through nine 2018 races is by far a career best. Keep in mind Almirola's only MENCS win was also at a restrictor plate track. He won the rain-shortened Coke Zero 400 at Daytona back in 2014. Now, he's armed with better equipment driving the No. 10 Stewart-Haas Racing Ford and is primed to run at the front of the pack. Ragan is one of the cleanest plate racers in the field. Even though he is driving equipment that is not entirely competitive, the veteran is patient and has a knack for avoiding “The Big One.” Ragan was one of only 14 cars to finish the second Talladega race in 2017 and has run 10th in the past two races at the track. His second career win came at Talladega in 2013. It was also the only one for this underdog operation (Front Row Motorsports). Can lightning strike twice? Though it's a small sample size, Wallace has finishes of second and 15th in two restrictor plate races. The runner-up finish in the Daytona 500 to start the year also put him on the map and in the running for Rookie of the Year. The driver of the No. 43 Richard Petty Motorsports car is getting more comfortable each week in his transition to Cup. Wallace will have high expectations heading into this weekend’s race. However, I expect he'll be able to meet them. Here is another driver with limited Talladega starts. Dillon finished 13th in his track debut last season. He also ran up front and led three laps during the race. He followed that up with an 11th-place result in the second race, tying his career best. Dillon, having a difficult sophomore season may fly under the radar. That means he will provide salary relief to reach for bigger names to fill out the remainder of a lineup.